I could say that this is a gold-plated cellphone with Swarovsky crystals and diamonds so it’ll cost you a lot. But it’s not… It’s still expensive though, just because it features a fancy clock inspired by pocketwatches and because Steve Madsen, its creator wants it to belong exclusively to rich folks. 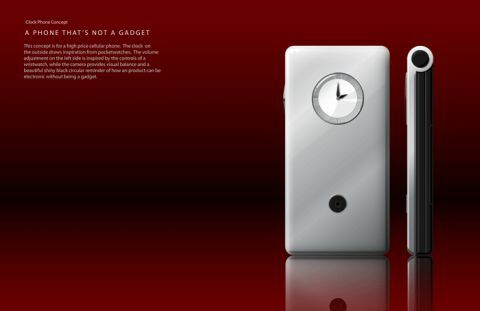 The Clock Phone comes with a volume adjustment mechanism on the left, inspired by the controls of a wristwatch. Check out the interesting integration of the camera with the aid of a simple black circular and shiny “spot”. Why is this expensive? Beats me, but there’s got to be more to this phone than meets the eye. Bang & Olufsen De Stijl Concept Phone – Multimedia and Style Nokia Tube Prototype Designed by Provoke?